founded around the 10th Century, it might surprise you to find, nestled amongst meandering lanes and stately old-world mansions, a store that’s thoroughly modern with a decidedly American twist. It’s a laundromat called Mr. Bubble’s Laverie. This entry was posted in News and tagged 450G washers, AWS, Coin Laundry, coin laundry industry, commercial laundry, commercial laundry equipment, Commercial washers and dryers, Compass Pro, Electrolux, Electrolux distributors, Electrolux equipped, Electrolux North America, Electrolux Professional, Electrolux Professional Laundry, Electrolux Professional North America, Electrolux washers and dryers, ElectroluxPro, Fluff and Fold, French launderette, Golden State Laundry, Las Cobas, laundromat, Laundry, laundry equipment, laundry industry, laundry innovation, laundry retool, Laundrylux, Mr. Bubbles laverie, new business venture, Perpignan, Self-service laundry, soft mount washers, sustainability, sustainability strategy, sustainable products, vended laundry, wash dry fold. Roots Bistro Gourmand opened in 2012 in a unique 100 year old building that once housed a teahouse with a hidden speakeasy. Located in West Islip on Long Island, Roots Bistro is an upscale casual restaurant serving contemporary French Bistronomic cuisine to local residents as well as New York City’s Hamptons’ set. Roots Bistro pays homage to the simplicity of the modest bistro while infusing gastronomic techniques. The restaurant has 67 seats enabling them to serve between 100 and 140 meals per day. Executive Chef Philippe Corbet has more than 10 years of culinary experience. Philippe grew up in France in a family of chefs, eventually earning his chef’s degree and graduating first in his class. He went on to work in a number of Michelin-starred restaurants. Joining forces with Corbet, Chef James Orlandi, trained at the Institute of Culinary Education in New York and worked in Michelin-starred Jean George’s restaurant. Orlandi’s passion and desire to challenge the conventional, helped forge a strong partnership between the two chefs. Philippe Corbet, Executive Chef / Partner with Chef / Partner James Orlandi. All ingredients are sourced locally. In fact, the fresh, close to home ingredients drive the menu — so it’s a constant evolution. Everything served from drinks, sauces, infusions, jerky, and even the ketchup, is prepared fresh in house. 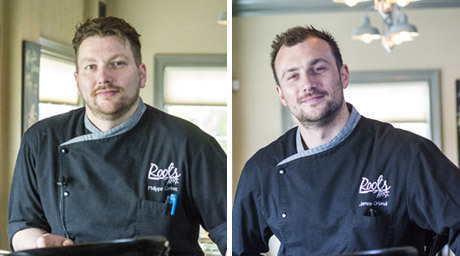 Roots is committed to sustainability and takes pride in working with local farms, wineries, butchers, and food vendors. Their vision, “to challenge traditional philosophy with rational arguments of pure creativity,” remains constant. And thanks to Electrolux Professional kitchen solutions, Roots is able to achieve this vision. So intuitive and simple to use, Electrolux Professional equipment helps chefs further advance their craft and hone their skills. The Electrolux Professional solutions provided were: 2 air-o-steam Touchline 6 grid ovens; an air-o-chill blast chiller/freezer; a cooking suite (range, grill, griddle and refrigerated drawers), and a warewasher with WashSafe control. This entry was posted in News and tagged Air-O-Steam, bistro, bistronomic, Chef James Orlandi, Chef Philippe Corbet, Electrolux, Electrolux Professional, Electrolux Professional food service, Electrolux Professional Kitchen, ElectroluxPro, french cuisine, gastronomy, Laundrylux, restaurant, Roots Bistro, Roots Bistro Gourmand, sustainability, sustainable ingredients, Touchline grid oven. This entry was posted in News and tagged Al Parco Residential Centre, barrier washers, Clean Room solution, commercial dryers, commercial laundry, commercial laundry equipment, commercial washers, Commercial washers and dryers, Electrolux, Electrolux barrier washers, Electrolux Professional, Electrolux Professional barrier laundry system, Electrolux Professional Laundry, Electrolux washers and dryers, front load washers, in-house laundry, Laundry, laundry equipment, laundry industry, Laundry infection control, laundry innovation, laundry operations, laundry solutions, Laundrylux, linen hygiene, nursing home laundry, on premises laundry, On-premise laundry, OPL, OPL laundry, sustainability. 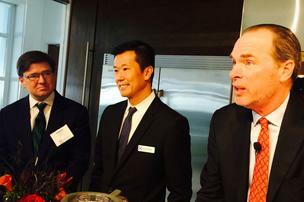 Electrolux AB President and CEO Keith McLoughlin, at right, will be the keynote speaker for Greater Louisville Inc.’s annual meeting in February 2015. Keith McLoughlin, Electrolux AB President and CEO, will be the keynote speaker for Greater Louisville Inc.’s annual meeting in February. Electrolux announced plans to buy Louisville-based GE Appliances from parent General Electric Co. (NYSE: GE) for $3.3 billion last summer. This entry was posted in News and tagged Electrolux, Electrolux CEO, Electrolux Professional, GE, GE Appliances, General Electric Co., GLI Annual Meeting, Greater Louisville Inc., Keith McLoughlin, keynote speaker, sustainability. The index, which was launched in 2013 in partnership with research firm Sustainalytics, is now a real-­time, quoted index appearing alongside other global financial data on Bloomberg investor terminals. It has shown a 21.8% return in the 12 months since it was created, the UN Global Compact said. The Electrolux Group sells more than 50 million products to customers in more than 150 markets every year. In 2013 Electrolux had sales of SEK 109 billion and 61,000 employees. For more information go to http://group.electrolux.com. This entry was posted in News and tagged commercial laundry, commercial laundry equipment, Commercial washers and dryers, Electrolux, Electrolux group, Electrolux Professional, Electrolux Professional Laundry, Electrolux washers and dryers, GC 100, global leader, in-house laundry, laundry equipment, Laundrylux, sustainability, UN Global Compact, United Nations Global Compact. At Electrolux Professional, we understand the positive difference the right tools and instruments can make. “The choice to have Electrolux Professional on board as a partner proved to be a great success,” shares the Gastronomy Project Leader of Adermatt Swiss Alps AG. The company was impressed with Electrolux Professional’s planning department and vast experience. The open kitchens in The Chedi Andermatt are capitalized as upscale gastronomy: all hotels have four open demo kitchens as well as studio kitchens, where guests can see behind the curtains of the culinary happenings. Electrolux Professional provided the complete solution for food services and laundry. Complete kitchens, including backup and production kitchens in the basement, were equipped with modern and efficient kitchen appliances from Electrolux Professional: customized induction stove, combination steam oven, pressure steamer, freezer and much more. “I appreciate the user-friendliness of Electrolux very much,” says Mansour Memarian, Executive Chef of the newly opened restaurant in The Chedi Andermatt. Electrolux Professional designed, delivered and implemented complete dishwashing facilities in the hotel as well: from the rinsing machines to the glass and basket washers up to the pan washers. Electrolux Professional laundry solutions save time, energy, and water… while increasing productivity. Even more important – Electrolux is unique in its ability to provide sustainable professional laundry and kitchen equipment; the complete solution from one source. 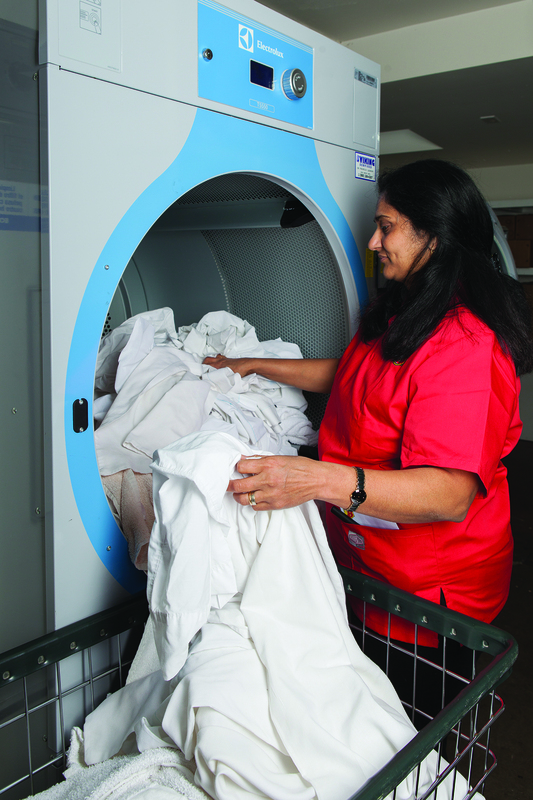 The laundry facility is equipped with Electrolux washers and dryers, wringers and finishing machines. This entry was posted in News and tagged Chedi Andermatt, commercial dryers, commercial laundry, commercial laundry equipment, commercial washers, Commercial washers and dryers, Electrolux, Electrolux Professional, Electrolux Professional Kitchen, Electrolux Professional Laundry, Electrolux washers and dryers, front load washers, hotel laundry, in-house laundry, laundry equipment, laundry industry, laundry innovation, laundry operations, laundry solutions, Laundrylux, on premises laundry, On-premise laundry, OPL, OPL laundry, professional kitchen equipment, sustainability. With five competing laundries in the Tacoma, Washington area, Susie Boyd knew exactly how she was going to make her laundromat, Mr. Bubbles, stand apart from her competitors and win over clientele – by creating a sparkling clean laundry environment. Susie’s ideal laundromat vision came to her quite effortlessly; she just kept on thinking – what kind of place would I want to would to do my laundry in? Susie gave the store a complete overhaul – from replacing all the outdated equipment, to installing energy efficient lighting, to altering the layout of the 2,000-square-foot space to maximize every inch. “We needed to accommodate the larger Electrolux Professional laundry equipment and make better use of the space,” said Susie. In addition to the super-fast and superior cleaning and drying power of Electrolux equipment, aisles were opened up, and a roomy folding area was created. The picnic-bench seating lends just the right touch, creating an appealing ambiance while giving customers plenty of room to sit and read, or take advantage of the free Wi-fi. As a first-time store owner, Susie knew she needed a laundry expert to help her re-tool and re-launch her store. She also knew exactly who to turn to – the 22-year veteran in the self-service laundry business who just happens to be her husband – Rich Boyd. Rich is the owner and president of SeaTac, Washington-based CESCO Equipment, a Laundrylux distributor. 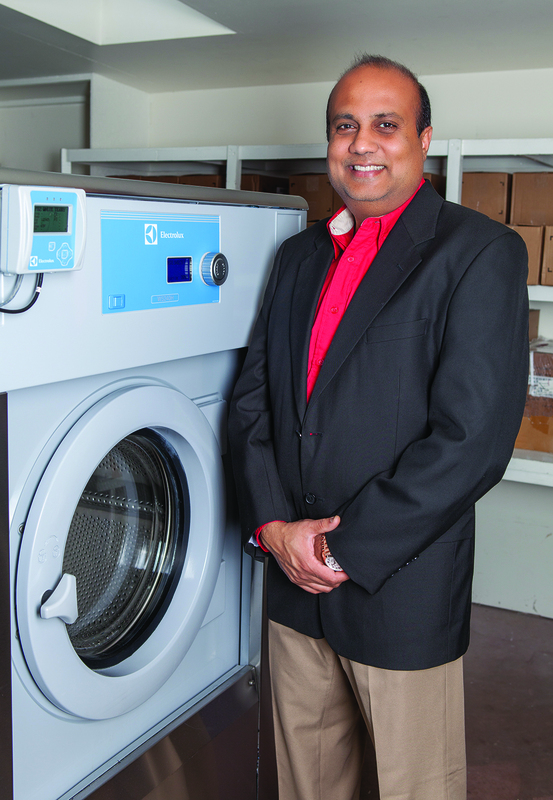 Prior to CESCO, Rich was the Western Regional Business Manager for Laundrylux. And how was it for Rich working with his wife on the creation of Mr. Bubbles? It comes as no surprise that the only laundry equipment choice for Susie and Rich was the Electrolux professional brand. “I could not be an Electrolux and Wascomat distributor, much less recommend these products to my wife of all people, if I didn’t believe they were absolutely the best washers and dryers in the business,” said Rich matter-of-factly. Susie couldn’t agree more. “We didn’t even discuss it, we didn’t have to,” added Susie. “Electrolux Professional laundry equipment has a proven record in durability and offers the largest energy savings. Choosing Electrolux equipment was by far the easiest decision we had to make.” Electrolux washers are the most innovative on the market with Automatic Water Savings (AWS) for lowest water consumption and Compass control for easy programming. Susie knew her husband wasn’t the only family member she could depend on to make Mr. Bubbles a success – she knew she could count on her son, Wesley, as well. After Wesley completes his schooling in the next few years, he’ll begin working full-time at Mr. Bubbles. One day, he will be its owner. However, the most gratifying experience for Susie was donating preloaded loyalty cards to a local church to distribute to those in need. “The biggest benefit in giving back is that is makes my heart feel good,” shared Susie. Today, the response from the community continues to be overwhelmingly positive. So much so that Mr. 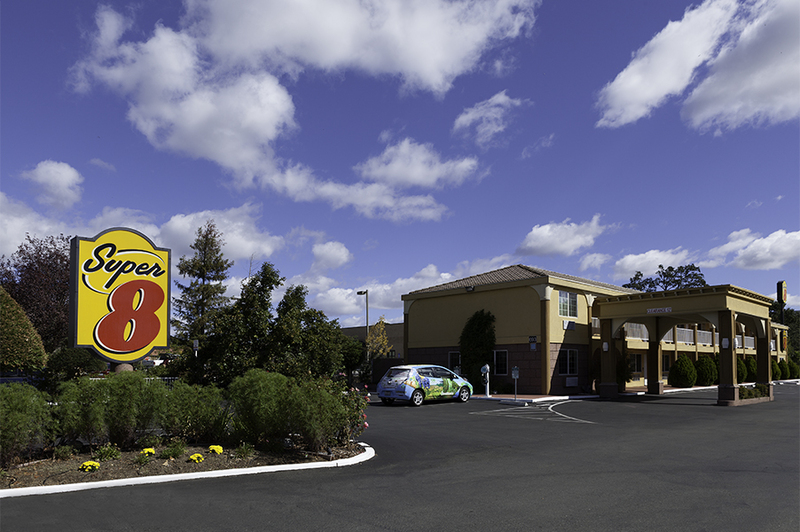 Bubbles recently received the 2014 Best of Tacoma Award in the Laundromat category. Each year, the Tacoma Award Program identifies local companies that enhance the positive image of small business through service to their customers and community. These exceptional companies help make the Tacoma area a great place to live, work, and play. “With five laundries within a mile of each other, being selected for this award was an incredible honor for us,” shared Susie. 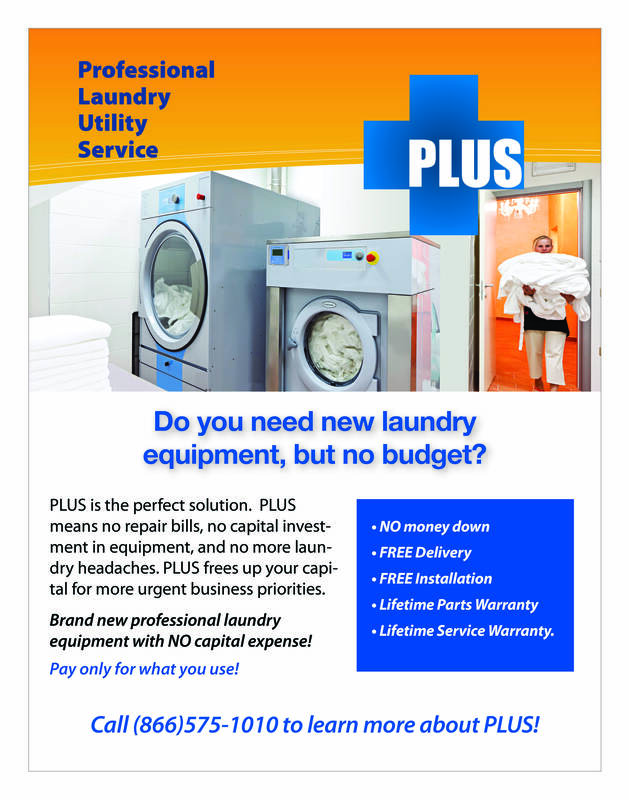 This entry was posted in News and tagged AWS, coin laundry industry, commercial dryers, commercial laundry, commercial laundry equipment, commercial washers, Commercial washers and dryers, Compass Control, Eco Power, Electrolux, Electrolux empowered, Electrolux equipped, Electrolux Professional, Electrolux Professional Laundry, Electrolux washers and dryers, family business, front load washers, laundromat, laundry equipment, laundry innovation, laundry operations, Laundrylux, Mr. Bubbles, Mr. Bubbles Coin Laundry, new business owner, professional laundry solutions, retool, retooled laundry, Rich Boyd, Self-service laundry, Susie Boyd, sustainability, Tacoma, vended laundry, Wascomat. Electrolux AEG unit’s new film focuses on the clothes that people put into their machines rather than the machines themselves… take a peek at this 40 min documentary on the impact of technology on the fashion world. This entry was posted in News and tagged commercial laundry, Commercial washers and dryers, eco-friendly apparel, eco-friendly fashion, eco-friendly material, Electrolux, Electrolux AEG, Electrolux Professional, fashion, film festival, Filmbuff, House of Radon, indie film, laundry industry, Laundrylux, organic clothing, sustainability, The Next Black, wearable technology.